The Oxford welded grill top door features our interior hidden quality welds. The welds are on the inside for a smooth, clean look with no sharp weld burrs. This means added safety for your horses! The Oxford welded full grill door allows you to see everything going on inside of the stall and offers superior ventilation. The shavings guard at the bottom of the door keeps the aisle way clear of debris. This Oxford welded grill top with mesh bottom door is safe for all ages of horses. The mesh bottom is great for the young and the top grill section prevents horses' hooves getting caught if they rear up. Let the fresh air in with our Oxford welded v-door; ventilation in your stalls is key. With our Oxford welded v-door your horses will get the fresh air they need in the safety of their stalls. Additionally, the v-doors are removable. The Oxford welded full grill v-door is made from galvanized steel. Steel is three times as dense as aluminum, which means our steel stall doors are much more durable than aluminum stall doors. 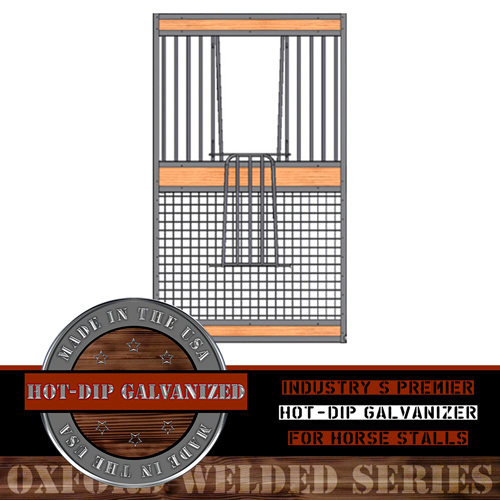 The Oxford welded mesh v-door is built for durability and longevity. It's welded together to form one solid structure. The added v-door allows your horses to be able to socialize with other horses. The Oxford full-swing gate provides excellent ventilation for those hot summer days. These swing gates are great for wash and tack rooms as well; the bars are close enough that your horses can't get stuck. The larger version of the half swing mesh gate. Keep barn critters out with this swing gate that is capable going all the way down to your horse stall floor. Mounts to the inside of your stall support posts and opens inward. The Oxford welded full mesh doors provide the excellent ventilation while providing max containment! These stall doors are great for the young; they can't get their hooves or legs caught in the mesh. Keep your horses cool with our Oxford welded half-swing grill gates. These gates are able to be installed behind your sliding door(s) to allow for the maximum amount of fresh air into a horse stall. Oxford welded heavy-duty mesh swing gates lets your horses socialize with other horses passing through the aisles. Mounts inside of your support posts and opens inward into the stalls. Oxford welded stall doors are available with many different options. Each option lets you choose exactly the kind of door you’d like for your horses’ needs. Oxford welded stall doors can come with either a hot-dip galvanized or powder coat painted finish (custom colors available upon request). 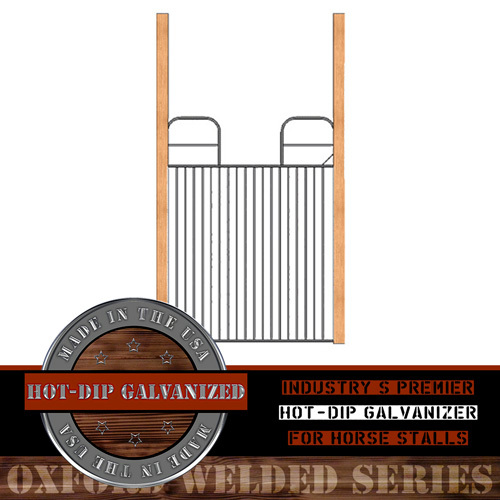 These doors feature very strong and professional hidden interior welds that will give your horse stalls a cleaner look, with superior rust protection. They make a great addition to any equine facility, arena, or barn!